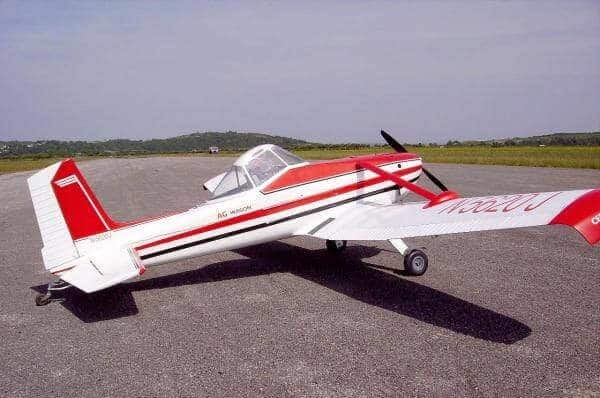 This one is powered by a 3W55US which gives vertical performance and is a delight to fly for towing or sport flying and makes an ideal first Tug. 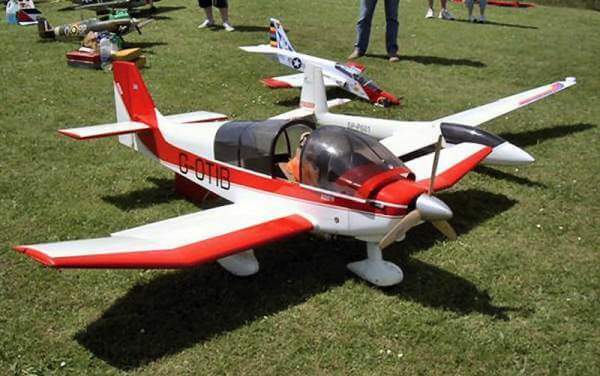 This is a very simple to build model with the fuz made from 0.8mm ply with 3mm ply doublers at the front and 10mm sq balsa longerons and cross pieces at the rear. the tails surfaces are all soft 1/2″ sheet balsa and the wings are foam. 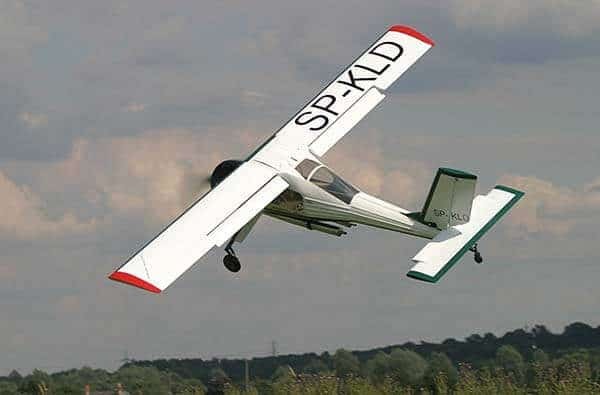 The SDD Greenley is an enlargement of this very successful Super Greenley and specially designed for 100cc motors to tow the biggest gliders. 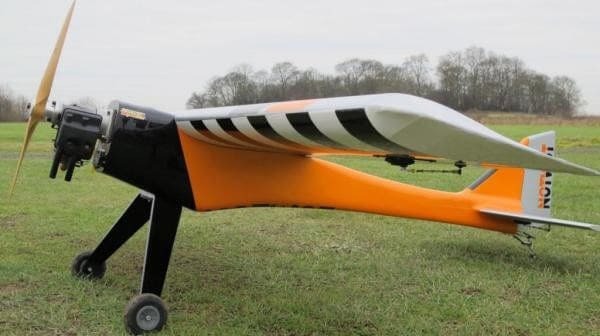 It has a built up 100″ wing which breaks into 2 pieces for easy transport. 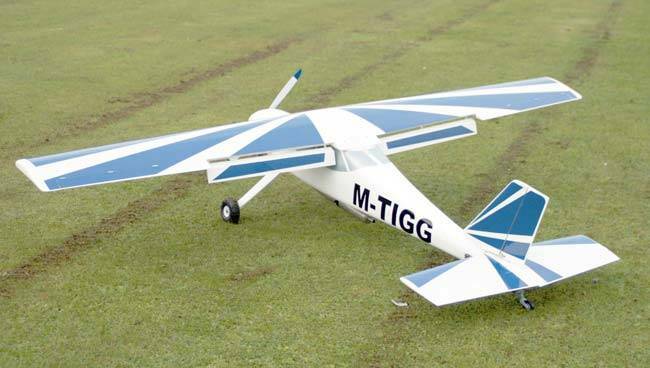 Free download plans for both models are available from the “Tug Plans” section of this website. Here is my Robin, 2.8m span which has visited the inaugural TVSA and Sandhays events. All moulded powered by Mackay 90 Twin, 26/10 Menz 3 Blade, KS mufflers, weighs 35 lb. Usually seen with a wayward Blanik chasing it around the sky.. The plane and engine are available from Stuart Mackay Models. All moulded 1/5 scale 90 inch span, 20 lbs fitted with Mackay 30-45 cc and available from Stuart Mackay Models. Telemaster 95″ span all built up construction. Available from Hobby Lobby. Powered by Super Tigre 2000 25cc Fueled by Model Technics Big Brute. Just Engines Purple Pipe fitted. Well worth it for the extra gain in power. Largest models towed to date CW. Minimoa, Pat Teakle ASW 20. Top Rippin Fox. MPX ASH 26. MPX Alpina. Flair ASK 8. Super stable in the air but doesn’t like cross wind on ground. 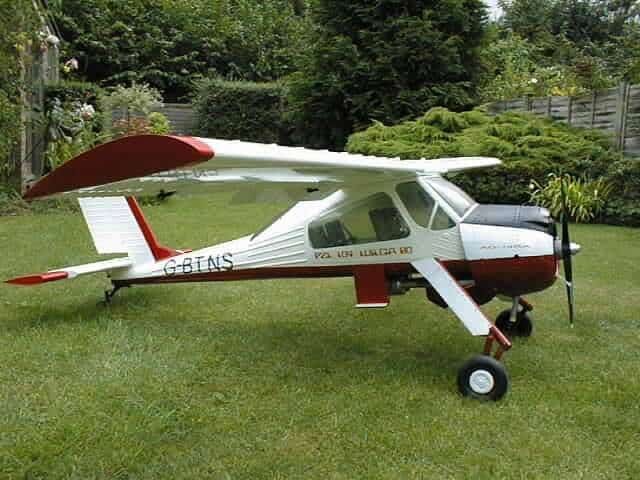 This is the 1/4 scale version of the ubuiquitos Frisch Wilga. 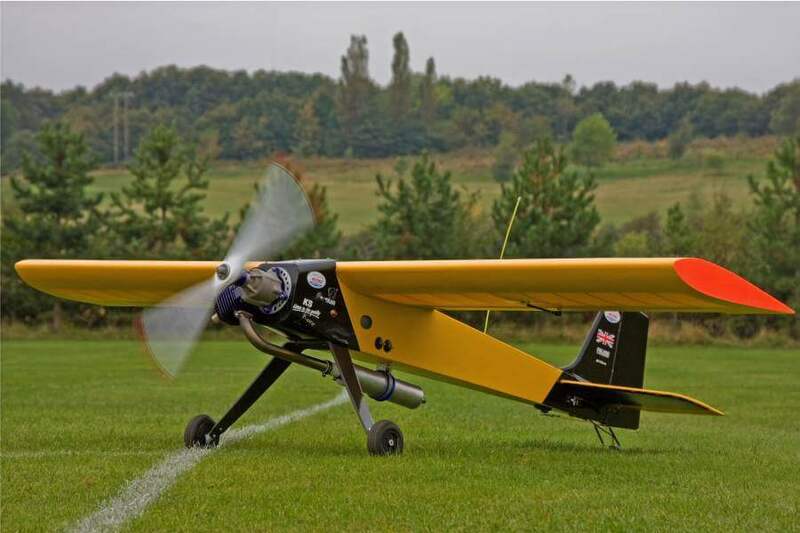 Now in its tenth year is capable of towing up most of the gliders which visit our aerotows. It spans almost 3 metres and weighs in at 35lbs so it has stability and with its long gangly legs is unmistakeable in the air. 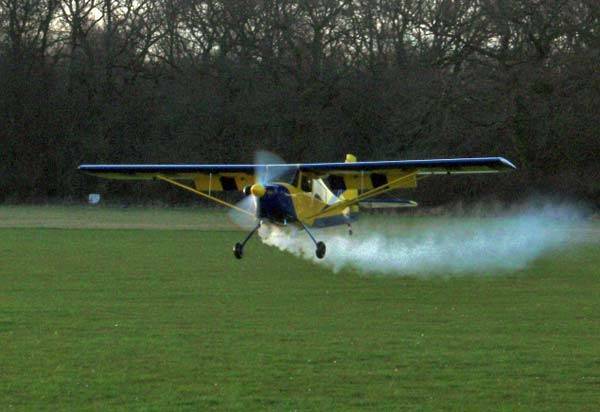 Powered by a DA 100, for noise and general towing a 28 by 10 prop seems best. Futaba is the radio link and an Emcotec dual rx/ servo interface is the onboard equipment. Electricity comes from three batteries; two 2.7amp for the Emcotec and one 2.5amp driving the ignition. Krumscheid silencers keep the noise very low. The model is not the easeist to build build, Alex Frisch leaves a good deal of the construction to the individual builder, but the quality is excellent. 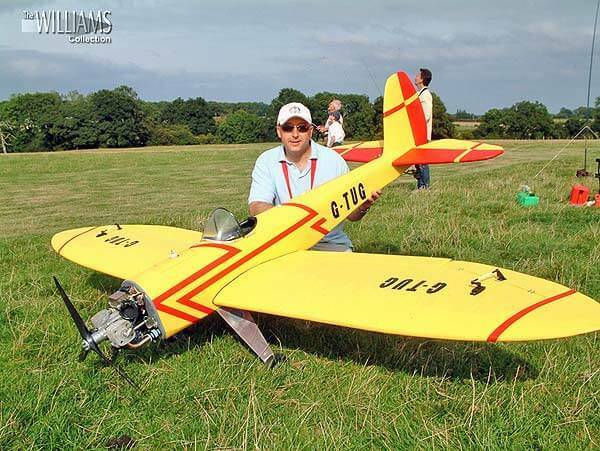 Decals were supplied by Tony Wood and the model is loosely based on a Polish glider tug-what else!. The fuselage is made by Guenter Wallus and the wings are made from Thomas Budszus. 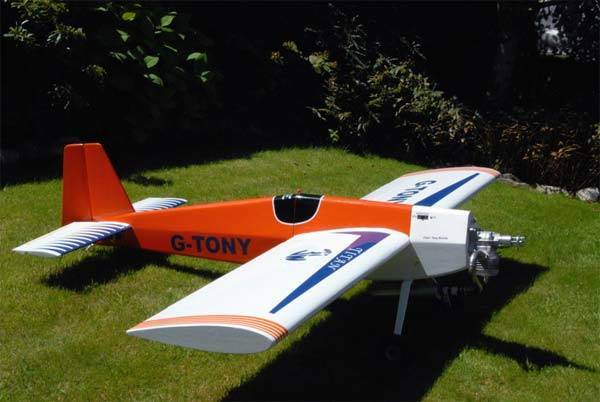 The wing span is 3 metres with a MVVS 116 up the front with plenty of power in it. It turns a 30×10 prop. It has 2 synth receivers in it powered by 2 6v 4300 milli amp batterys with a 6v battery on the ignition.It also has a 12 channel emcotec installed in it. The flight characteristics are very good, a very good stall rate on it. All it does is slowly drifts to the right, for landing if you drop the flaps down it comes in at walking pace. 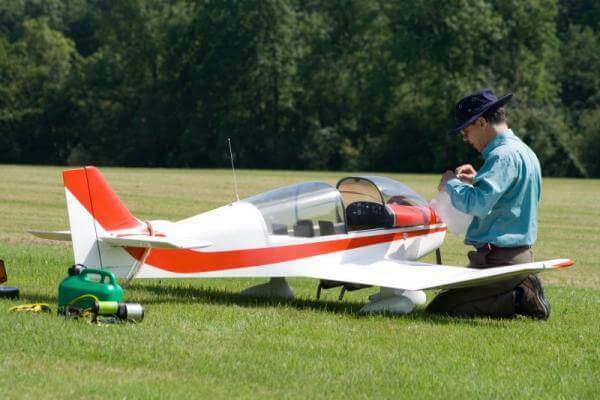 Overall it is a excellent plane and I am hoping to fly it more this year. 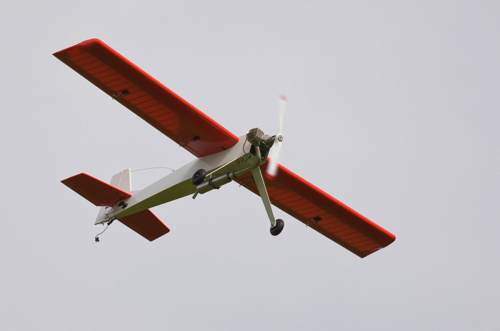 Powerbox Evolution for Rudder, Elevators, Ailerons, Flaps and TOST tow release. Two 3300mAh batteries, locking toggle switches and a servo on the ign kill switch. JR 10 ch Synth SPCM rx. Engine is MVVS 58cc, which is awsome and this year I have the matched cannister instead of the cr@p JMB one I was using. I have 3 blade props 24*10 and 22*10 for noise sensitive sites, but a good old JXF 24*10 seems to work really well with this engine. Flight reports are found elsewhere as I’ve not had the privilege yet, but hope to do some serious towing this year. 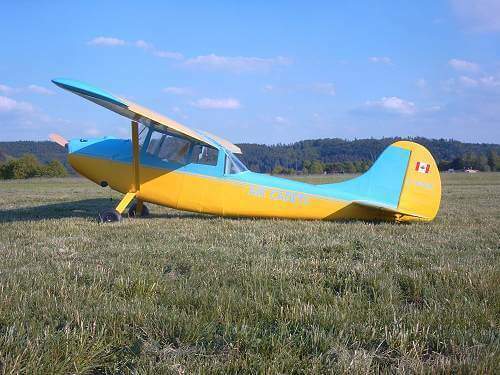 1/4 Scale piper cub, based on the Toni Clark plan. It was originally built in 1998/9 by Colin Bond. 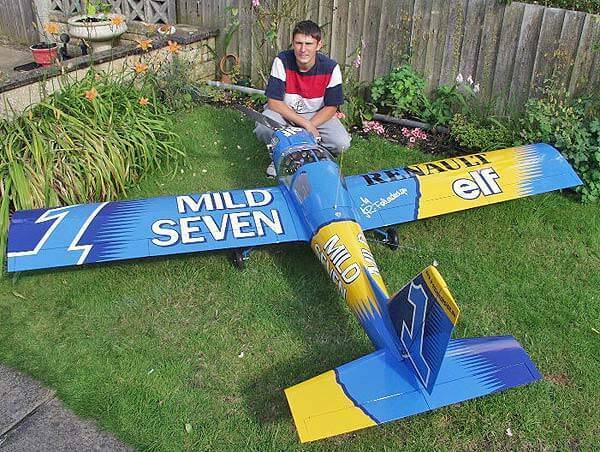 I flew it at one of the meetings that we had at Lasham, and subsequently bought it from him. It originally suffered from not having enough side thrust, and this contributed to it’s first demise at the Caen Aerotow the following year, trying to tow up CW’s Petrel. (Heavy, no wheel, and a cross wind). I re-built it and put in the correct side thrust, which greatly improved things. It has subsequently been damaged a few times, mainly due to my unfailing ability to get the tow line caught on anything within a 100 mile radius of where I am landing. 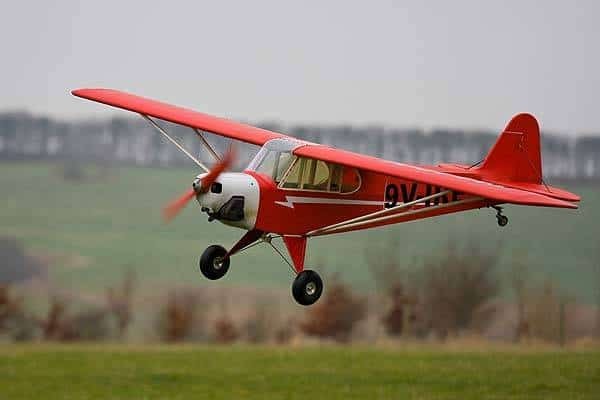 The cub’s notorious ability to bounce on landing, and my own inability to land it well, have been the downfall of more propellers than I like to remember. Suffice it to say I usually buy them 6 at a time. However as I probably do more take offs and landings in a day than most sport fliers do in a couple of months I guess it will go wrong now and again. I would estimate the total number of tows over the years to be getting on for 1000. I wish I had a log book for it. Yesterday we towed CWs new Schweizer. This entailed about 20 tows, and then a race for the ground, so that I could take Video and photographs of CW doing his stuff. never say a tug pilots life is easy. 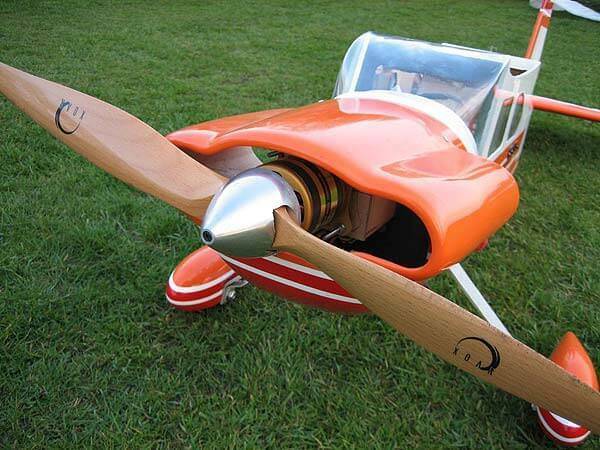 The cub has a span of 109 inches, weighs about 25 Lbs, and is powered by a Zenoah Z62. Producing about 4.25BHP. 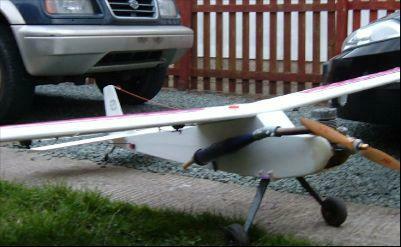 I can tow gliders up to about 30Lbs, depending on the glider, and the glider pilot. The Wotever came to me as a bare airframe salvaged from the depths of Dungeon Bond (Colin’s garage) for just a couple of Pony’s. ZDZ 80cc with Krumshied muffler, Dubro tank with fittings, Biela 27×10 carbon, Hitec & Graupner servos, JR PCM receiver, 2700mah NmHi x 3, SM Battery Backer, Fema wheels, plus a few other tricks of the trade. Not much change out of a couple of Monkey’s there then ..? The most useful feature has to be the “FLIP”… No really …!! The Fuel Level Inspection Port consists of a hole in the side of the fuselage where you can check the fuel level in the tank as you taxi past, brilliant …!! There is also a “BLIP” in the top of the fuselage. Work it out everyone. Partly built by Chris Strong and Stuart McKay, “completed” by myself, my first “proper” tug. 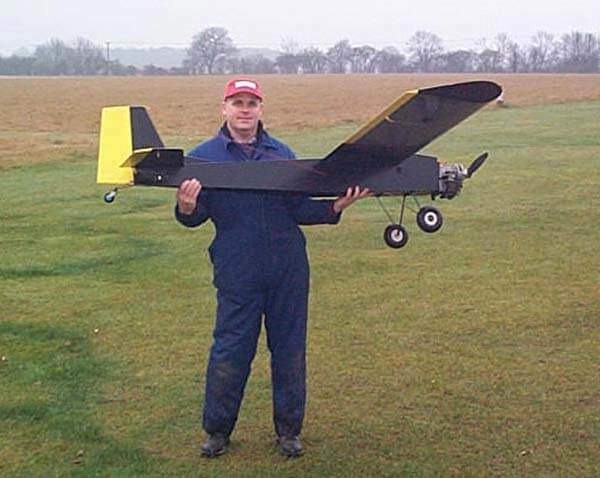 Copes with a wide range of conditions, fairly easy to fly. The model as is 1/3 scale model specifically designed for towing. by Airworld. The Motor is a King 100cc boxer twin. Prop is 25×12 3 blade Biela, Pipe / Krumscheid silencer RPM not measured yet. Starts nicely, sounds super. Glass fibre baffles (PC board) fitting into the front of the cowl to ensure all the air going into the cowl travels via the engine. Bags of power, I will investigate when I have more hours on it, but vertical climb seems quite likely. 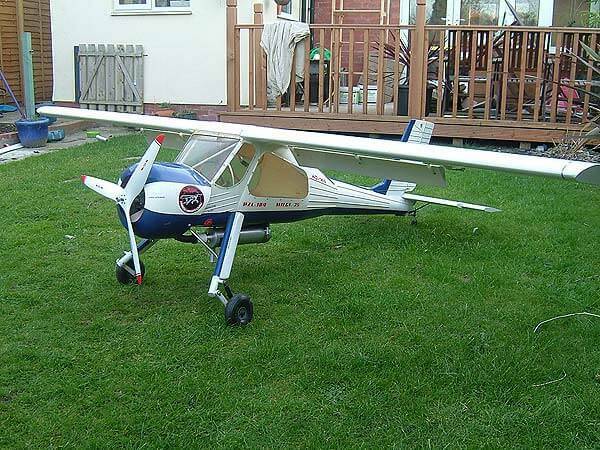 This is the first prop I have tried, there might be scope for improvement with size and engine mixtures etc. However, I like it as it is, not stopped when it shouldn’t yet and is very quiet and “scale” noise….. Some servos might need an upgrade from the current Hitec various types, but I can stall most with my fingers rather too easily for comfort. Nose wheel now on a Multiplex Rhino. Ignition power 4 cell 3,700mAhr, radio power 2 x 4,900 2cell LiPo via PowerBox Sensor electronic switch / regulators. Rx Multiplex IPD 12ch. Servos assorted Hitec except Multiplex Rhino on nosewheel. Martins’ Bull has had a 3.5 month rebuild and is fitted with a Zenoah 62 with tuned pipe, MPX radio and Futaba servos. I know electric tugs aren’t common but due to our location we can only fly electrics or four strokes and as large four strokes are not readily available we went down the electric route. NOTWOT is powered by a Zanoah 62 and will pull most things up to third scale. It was built from a Rainer Vogt part kit from Germany. Wingspan is 2.86m. and I fitted a Zenoah Z62 engine, with Easystart. 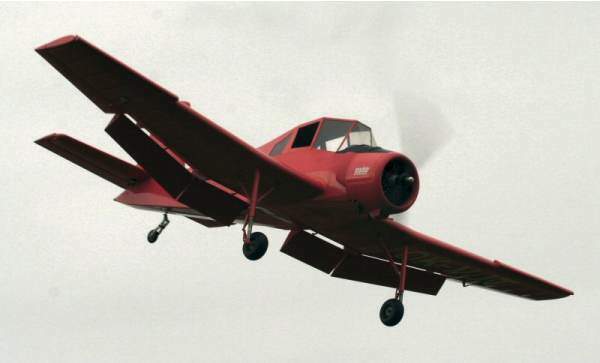 The stressed parts of the fuselage, and the landing gear area, have been strengthened internally with carbon/kevlar cloth, and the model flies as if on rails, but with a fair aerobatic ability. It tows up 4 and 5m. 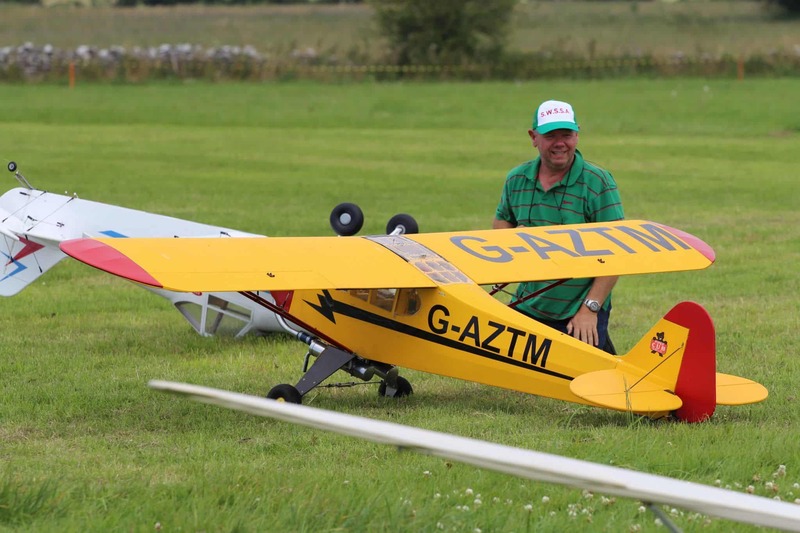 gliders with ease, but I only rarely fly as no-one is interested in aerotowing where I am situated, so I am limited to when my copilot is available – rather a waste of a superb tug!